At Maria Kim, DMD, we take a preventive approach to dental treatment. Because it is easier to prevent a problem than to treat it, we design preventive plans to meet the oral health needs of our patients and focus on early diagnosis and treatment of dental conditions. When you join our dental practice as a new patient, Dr. Kim will perform a comprehensive oral examination of your teeth, gums, bite, and jaw joints to determine your current oral health. We will never make you feel bad about your conditions, even if it has been awhile since you visited the dentist. Our team is friendly, understanding, and will support you in getting your oral health back on track. Diagnostic x-rays are the best way to see what is happening beneath the surface of your teeth. We use dental x-rays, with low radiation, to identify decay, fractures, infection, and bone loss. Diagnosing conditions early saves you time and money. Dental x-rays are extremely high speed, safe, and so low in radiation that you actually absorb more radiation from the sun. Our dentist will then take the time to help you determine the best dental treatments for your needs. Your dentist is often your first line of defense when it comes to oral cancer. At each exam, we will look for suspicious lesions and pre-cancerous tissue. An oral cancer screening from Dr. Kim could save your life! Even if you brush and floss as recommended, it is common to have tartar build up at your gum line and between your teeth. We use precision instruments to gently remove all traces of tartar and to keep your gums healthy. Nothing compares to the fresh, smooth feeling you have after a professional dental cleaning! According to the Centers for Disease Control and Prevention, over half of American adults suffer from periodontal (gum) disease. Researchers have linked periodontal disease to serious conditions such as heart attacks, stroke, and diabetes. If you have symptoms such as bleeding gums, pain, gum recession, bad breath, or tooth mobility, we can help restore your oral health and comfort. 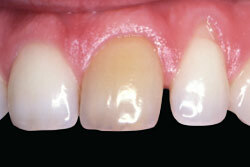 Deep cleanings to remove infection and bacteria will allow your gums to heal. Healthy gums are the foundation for your teeth and essential to good overall health! Some people, especially children, can benefit from the added security of additional preventive treatments. We address the problem of decay before it starts with fluoride treatments and dental sealants. Fluoride – Bacteria create an acidic environment in your mouth that softens your teeth’s protective enamel. Fluoride treatments strengthen your enamel in addition to reducing sensitivity due to recession. Dental Sealants – Dental sealants work by creating a barrier between your teeth and the food particles and bacteria that cause decay. Sealants cover the deep grooves on the chewing surfaces of your teeth, where decay is most common. Because they last up to five years, sealants are a cost-effective complement to regular home care and professional dental cleanings. Nightguards – Your jaw exerts enormous force. A nocturnal grinding or clenching habit can cause damage to your teeth. Wearing a nightguard creates a barrier between your upper and lower teeth, providing a buffer. We create custom appliances that fit snugly and feel comfortable. Snore guards - Experience restful sleep with our highly-effective snore guards that allow you to breathe easy. Snore guards work by gently moving your lower jaw forward while you sleep, opening your airway. Contact our Arcadia, CA dental office to schedule your next appointment. Our team looks forward to welcoming you to our office and giving you the great care you deserve. As with all procedures, there are some risk of side effects that could occur when getting a deep cleaning. In order to make sure our patients are fully informed, we've uploaded our consent form with a full list of potential risks on our website. Click here to read the deep cleaning consent form. Because of the hormonal changes happening in your body, you may notice that it is harder for you to keep your gums and teeth healthy. It is common for women to experience "pregnancy gingivitis" or gum disease due to pregnancy. At Cosmetic and Family Dentistry, we work with expecting mothers just like you to keep your gums healthy and eliminate the infection caused by gum disease. The inflammation that comes from having periodontal disease is especially dangerous during pregnancy. Having periodontal disease can cause a number of systemic conditions including low birth-weight in newborns. We understand how important it is to have a healthy baby. We work with expecting moms to customize treatment that will keep you and your baby’s health on track. Improved home care – We will discuss ways to improve your home care regimen to eliminate infection and bacteria from your gums. Regular dental appointments – We can closely monitor your health to make sure that your pregnancy gingivitis stays under control. More frequent dental cleanings – Some expecting moms find it is easier to keep periodontal disease from reoccurring when they have more frequent dental cleanings. Special products – We can recommend products and rinses that may help. A healthy diet – Just as with your overall wellness, a healthy diet is essential to good oral health and provides the nutrients you and your baby need, especially during this time. If you have more questions regarding your dental health during pregnancy, please contact our dentist office in Arcadia, CA. Dental exams and professional cleanings are helpful in maintaining the health of your smile. What you do at home can also play a big part in your overall oral health. Certain lifestyle habits cause unnecessary stress on your teeth. Your diet and lifestyle habits can also contribute to decay, periodontal disease, and a dark or yellow smile. By eating a healthy diet and staying properly hydrated, you are giving your overall health a boost – that includes your teeth and gums! Certain medications, cancer treatments, and medical conditions may make it harder for you to have great oral health. When you come to our Arcadia, CA dental office, we can discuss personalized lifestyle adjustments to protect your teeth and gums. Periodontal conditions can contribute to systemic illnesses such as low-birthweight babies, diabetes, heart disease, stroke, erectile dysfunction, Alzheimer's disease, and respiratory illnesses such as pneumonia, COPD, and bronchitis. Our office features a comprehensive approach to your health. We believe in addressing the cause of the problem – not just treating the symptoms! If you have more questions regarding what you can do to help protect your teeth, don't hesitate to contact us and schedule an appointment. It might be from beverages that you drink. Coffee, tea, soda, diet soda, energy drinks, wine, and certain juices are high in acid. Acid can soften the protective enamel covering your teeth and cause decay. Making adjustments to your lifestyle and habits can help. Additionally, we offer fluoride treatments to help keep your enamel strong. Call our office to schedule an exam with Dr. Kim to learn more about your options. Mouth Ulcers Hurt! What's behind Them? Most of us will have a mouth ulcer from time to time and if you have one, you know they can be difficult to ignore and quite painful! Sometimes mouth ulcers pop up because of a love of citrus or tropical fruits and sometimes they seemingly come out of nowhere. Have Questions about Dental Care At Home? Ask Our Office!